Around 3pm each day, I find myself having a hard time focusing. Actually, that's not true at all. I am actually quite focused. I cannot stop thinking that I would do just about anything to get my hands on something sweet and chocolaty. Over the years, in my quest to become healthier and eat honestly, there is one thing that I absolutely will not give up: sweets. I cannot stress enough how much I love desserts and my kids have inherited that gene. But, just because we would much rather eat dessert first, it doesn't mean that we have to eat junk made with preservatives and modified ingredients. My recipe for these energy bites is so good that my son's friend (not a health nut by any stretch) asks for them when ever he's at our house. They are the perfect answer to my afternoon chocolate craving, the most delicious dessert served with coffee, tea or a glass of red wine, a satisfying and energy-packed way to start the day or a healthy addition to your child's lunch box (if their school is nut-free, just substitute sunflower seed butter for the peanut butter and omit the cashews). The best part is that they are packed with sneaky healthy ingredients that your kids (or their friends) won't know they're eating, but will reap the benefits: more energy for sports, focused attention while doing homework, less mindless snacking on junk because they'll be satisfied...just to name a few! I always make an extra batch and keep them in a sealed container in our freezer. They will last for about 3 months, but honestly my family eats them long before then. Our favorite way to enjoy them is straight out of the the freezer. When you first bite into them, they are cold and frozen, but they warm in your mouth and get chewy and delicious. 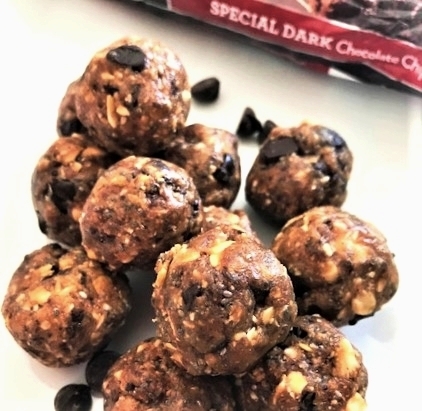 My kids think they taste like cookie dough balls, that's quite a compliment coming from two fellow dessert-addicts! In a food processor, mix all the ingredients EXCEPT FOR THE CHOCOLATE CHIPS. Pulse about 8-10 times, don't over mix, it will get gummy tasting. If the mixture seems too wet, add a bit more of the oats. If the mixture is too dry, add 1 TBSP water. Dump mixture into a large bowl and add the chocolate chips. Mix well with a spoon, or your hands. Roll the mixture into 1 inch balls and place on a sheet of parchment paper to rest. . I put 6 bites per parchment paper and then layer on top of that. I wrap the entire stack in plastic wrap, then put in a large freezer-safe Ziploc bag and put in the freezer.